Hawaii Territory Survey, Niihau Hawaiian Islands, 1904. 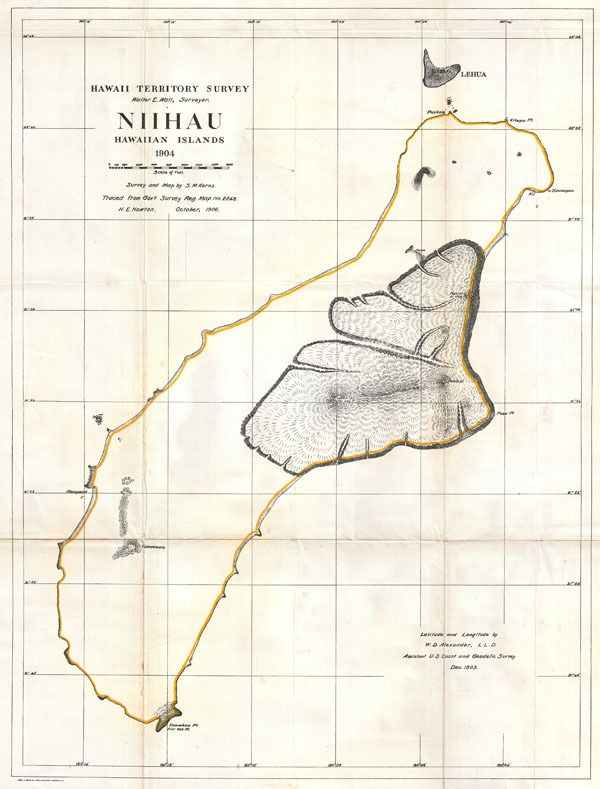 This rare and extraordinary 1904 map of the island of Niihau was prepared for the 1906 Report of the Governor of the Territory of Hawaii to the Secretary of the Interior. The Report was an attempt to assess and examine the newly created Hawaiian Territory's potential for proper administration and development. Depicts the islands topographical details. Prepared H. E. Newton from a survey originally drawn by S. M. Kerns. Very good condition. Minor verso reinforcement along original fold line. Minor discoloration along original fold lines. Blank on verso.